Ancient underwater remains thought to be a "long lost city" are in fact the result of a naturally occurring phenomenon, researchers have found. 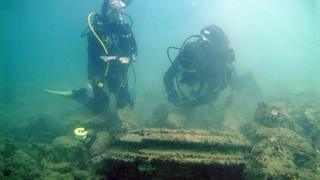 The site, found by snorkelers off the Greek island Zakynthos, appeared to have paved floors and colonnades. But research by the University of East Anglia and University of Athens has found the site was created by a geological process. The formations, researchers found, were created up to five million years ago. Prof Julian Andrews said: "The site was discovered by snorkelers and first thought to be an ancient city port, lost to the sea. "There were what superficially looked like circular column bases, and paved floors. "But mysteriously no other signs of life - such as pottery." Found close to Alikanas Bay the site was examined in situ by the Ephorate of Underwater Antiquities of Greece. "We investigated the site," said Prof Andrews, "and found that it is actually a natural geologically occurring phenomenon."